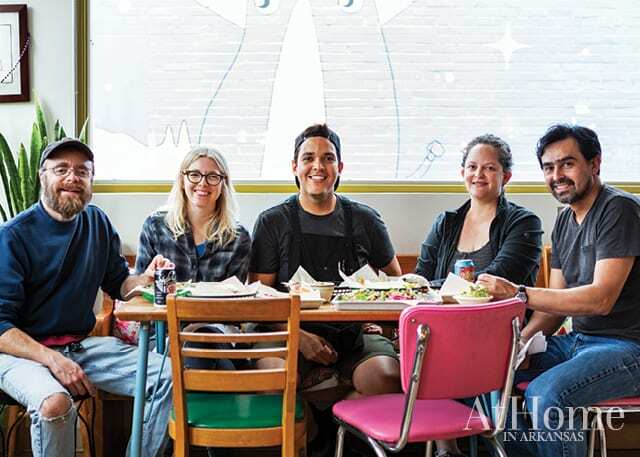 One couple’s passion for locally sourced food continues to grow in downtown Little Rock. Corri’s passion wasn’t unmet. Years later she was shopping with the Arkansas Local Food Network (ALFN) when she met her now-husband, Jack Sundell. “At that time it was called Arkansas Sustainability Network and was just an email list,” she says of the resource that has since become a staple shopping experience for many central Arkansans. For the pair, shopping with ALFN wasn’t a trip to the grocery, but rather part of a deeper love of fostering community and enjoying local fruits—literally. As with Corri’s instilled childhood experiences, Jack brought years of food and gardening knowledge to the relationship. After marrying, the couple embarked on a three-year startup process to launch a restaurant with locally sourced foods. The Root Cafe opened its doors in 2011, and now they’re off to the races again, planning and preparing for this summer’s opening of Dos Rocas Beer & Tacos. “Our mission statement at The Root is ‘Building Community Through Local Food,’” Jack says. To accomplish this, the restaurant’s menu features dishes made from ingredients from more than 50 Arkansas farmers. The Root Cafe started with breakfast and lunch and added dinner to their offerings in 2017. “We wanted to do things a little bit differently at night, so we offer table service rather than the counter service we have during the day,” Jack says. 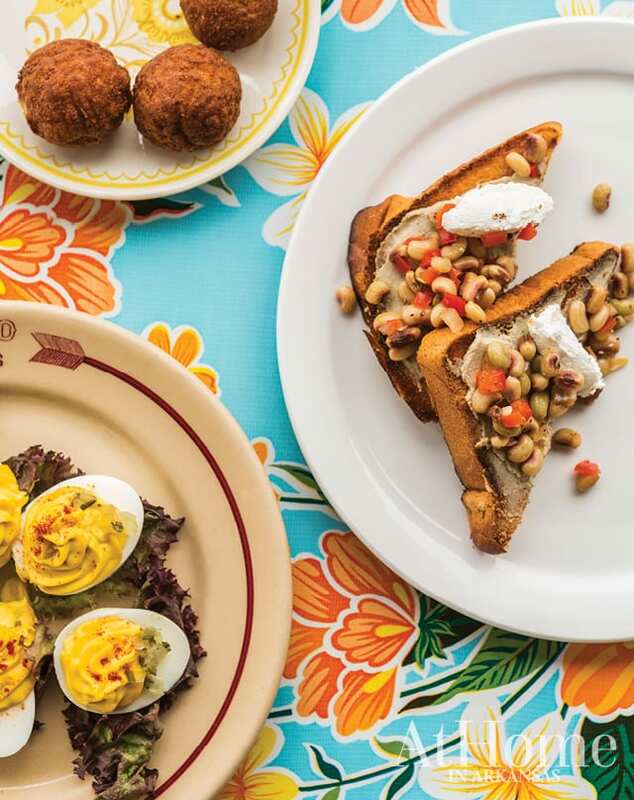 “For the menu, we try to keep the same idea of foods that your grandmother would recognize—so you’ll see deviled eggs and our toast with purple hull pea hummus,” he adds. In tune with their mission statement, much of the startup process for the restaurant involved community-centric events, including organizing canning and food preservation workshops and fundraising dinners. Today, they continue to be good neighbors by hosting and co-hosting events like their annual Hot Pepper Eating Contest, Traditional Pie Bakeoff & Recipe Swap, and the much-anticipated Beard Growing Contest. WHEN TO EAT >> Breakfast & Lunch Tuesday–Friday, 7 a.m. to 2:30 p.m. and Saturday, 8 a.m. to 3:30 p.m.
Scroll down for The Root’s Pickled Pinto Beans recipe! 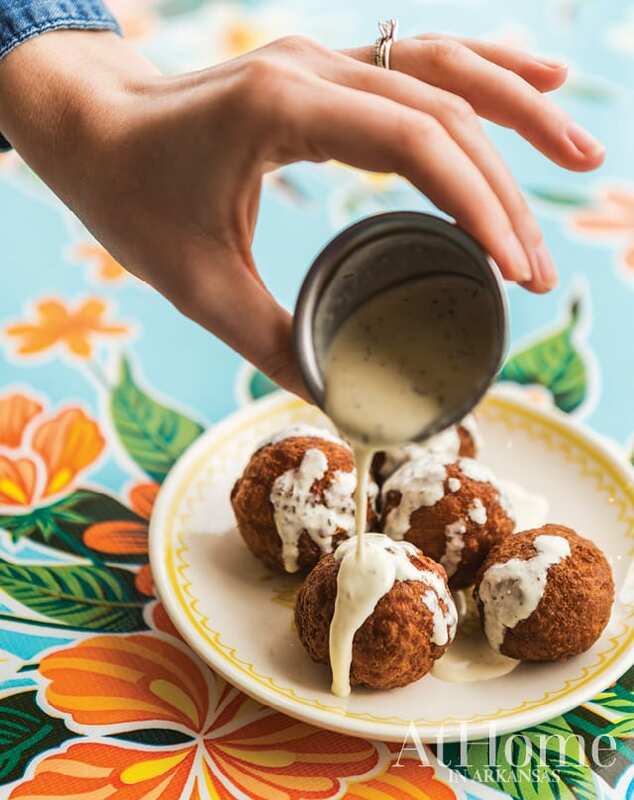 This summer, Corri and Jack plan to open Dos Rocas Beer & Tacos just down the street from The Root in a space that was once occupied by Juanita’s Party Room. In partnership with another couple, Adelia Kittrell and Cesar Bordon-Avalos, they hope to create a casual, family-friendly atmosphere with—you guessed it!—locally sourced dishes. Cesar is well-versed in Arkansas-produced foods, having served as The Root’s lunch kitchen manager since 2012. Luis Vasquez, who is currently the breakfast chef at The Root, will be managing the kitchen at Dos Rocas. 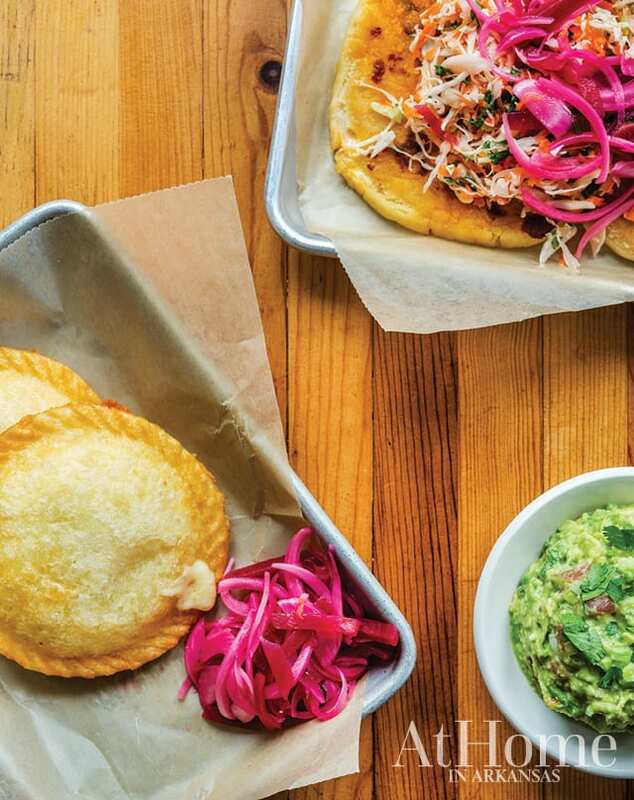 As a native of Honduras, Luis brings his own Latin American influence to the restaurant. The team has been gathering every Monday at The Root for tasting sessions, creating their vision and tweaking recipes to taste-bud perfection. 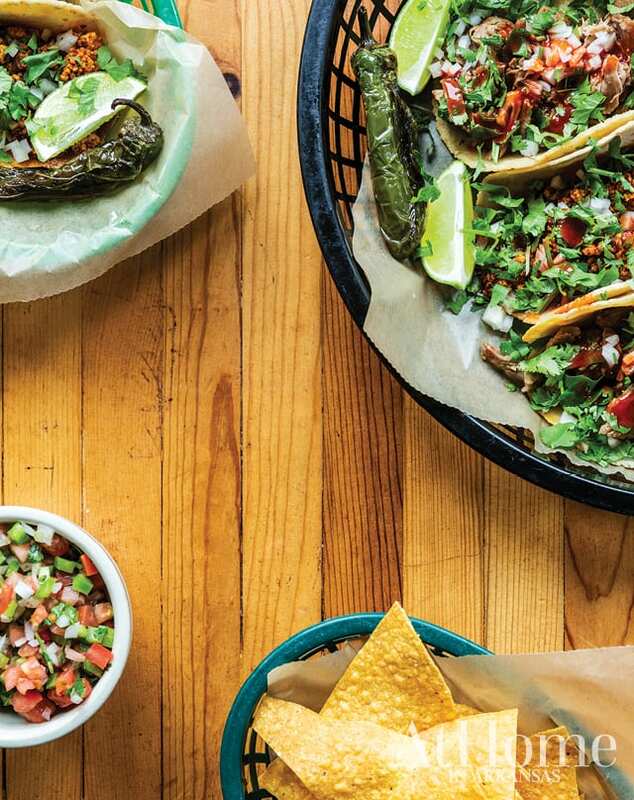 Dos Rocas’s menu will include a variety of tacos and Latin American street food along with house-made margaritas and a huge selection of local craft beers. 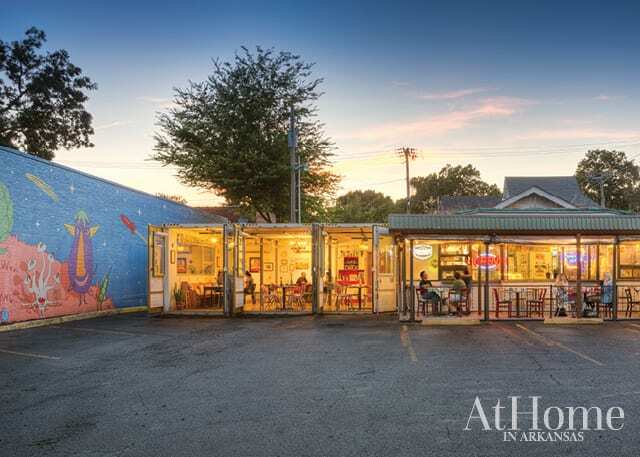 “Jack and Cesar love this aspect, and we’ll definitely have a ‘best of Arkansas’ lineup,” Corri says of the restaurant’s brew offerings. As for the name, “Dos Rocas means ‘two rocks’ and refers to Little Rock, and also to Cesar’s hometown in Paraguay, which is called Itá and translates to ‘rock’ from his native language of Guaraní,” Jack says. WHEN TO EAT >> Lunch, dinner, and after dinner; Tuesday-Sunday. Official hours will be announced prior to opening. CONNECT >> dosrocasbeerandtacos.com Watch their website and Facebook page for details about their opening. 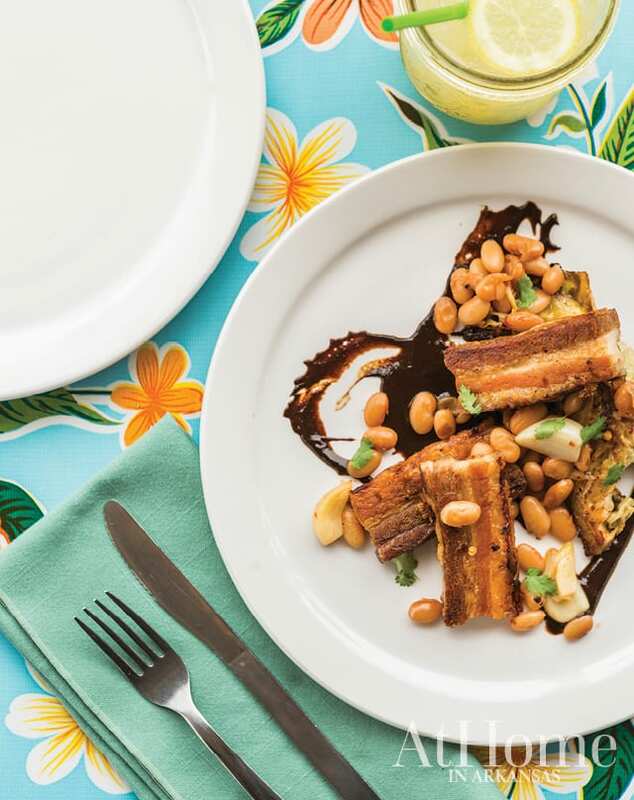 A staple on The Root’s dinner menu, the pork belly is served with pickled pinto beans and cream-braised cabbage. Use the restaurant’s recipe to recreate the beans in your own kitchen. Combine pinto beans and whole garlic cloves in a heavy-bottom pot and cover with 2 inches of water. Bring to a simmer and cook until beans and garlic are just softened, about 25 minutes. Drain and rinse. Return cooked beans and garlic to the pot, add remaining ingredients, and simmer for 5 minutes. Cool the beans in fridge and adjust seasoning when cold, if necessary.